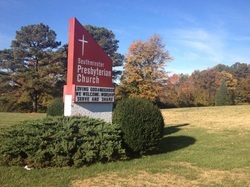 Presbyterians were active in Manchester and adjacent areas of Chesterfield County, Virginia at least as early as 1812. These records indicate that outposts and chapels were available for worship services south of the James River but that church membership was retained and recorded in the Presbyterian churches north of the James in Richmond, Virginia. On June 3, 1870 an outpost, sponsored primarily by the First Presbyterian Church of Richmond, laid the cornerstone for a modest one room building at 10th and Porter Streets, Manchester, Virginia. Shortly thereafter the congregation petitioned East Hanover Presbytery that they be officially organized as a church. On October 7, 1870 East Hanover Presbytery appointed a commission to handle this matter, and on November 21, 1870 the commission completed the organization of the new church. It was named The First Presbyterian Church of Manchester, Virginia. On May 19, 1871, the Reverend William A. Campbell was installed as the pastor of the church. In 1889 a new building at 10th and Porter Streets was completed. When Richmond annexed Manchester in 1910, the name of the church was changed to Porter Street Presbyterian Church. For more than 95 years the congregation worshipped at 10th and Porter Streets. The building is no longer there, but the old manse next door is the Bainbridge Community Center serving those in need in south Richmond. On June 5, 1966, in anticipation of constructing a new sanctuary at 7500 Hull Street Road in Chesterfield County, the congregation moved into temporary quarters at the Manchester High School, now Manchester Middle School. By congregational action and approved by Hanover Presbytery, the name of the church was officially changed as of that date to Southminster Presbyterian Church. On Palm Sunday, April 7, 1968, the first service was held in the present sanctuary. The Dedication Service was held Sunday, May 5, 1968. Southminster celebrated 50 years of worship and service on May 6, 2018. In 1981 a children’s education wing was completed and another building addition in 1989 added a new fellowship hall, parlor, classrooms, a conference room, staff offices, and a beautiful meditation garden in an enclosed courtyard. With almost 145 years of dedicated service, excellent facilities, and a committed membership, Southminster Church continues to serve Christ’s kingdom.